relationship; Mulder is drugged, then injured in the woods. Mulder. What if Samantha isn’t dead? copyright infringement is intended. Dr. Peterson, Dr.
could, and to Marlen for the beta. No one had passion anymore. water and he choked back a cough. same deadly dull notions of heroes throughout the centuries. But our Hero had no dragons to slay, no villagers to save. passion … once upon a time. his next order. This man was no hero, never would be. a bull with dental floss. that no one else was in the room. That was a good sign. Then he looked up at her with a frown. That was a bad sign. and I wanted to talk to you before involving Agent Mulder. anonymous source.” He slid the papers across the desk. just made her head start to ache. unlocking the repressed memories of his sister’s abduction. because it had become too hard and he was too tired? for some kind of peace of mind? Could she ever forgive him if he had given up on her? He knew he would never forgive himself. the issue again unless it was absolutely necessary. desk, asking for Samantha Mulder’s room. “That’s what I want to talk to you about. I’ve asked Dr.
Katherine Peterson, our visiting psychiatrist, to join us. are fake, she did give your mother’s name as next of kin. woman who was just stepping in. was going on and whether his “sister” was a willing player. He sat back down and Dr. Peterson took a seat next to him. spoke of a bright light and being unable to move or speak. she asked quietly. Dr. Williams appeared startled. The two doctors exchanged glances. “Very well,” said Dr.
room. When they opened the door, the room was empty. “I guess she’s been abducted again,” Mulder commented. No tears, not even that much interest in him, just suspicion. new twist in the old game. they were getting lazy or she hadn’t done her homework. to you.” He started toward the door. “What else?” he asked, without turning around. He turned around, shaken by the tearful revelations. Before she could answer, a new voice interrupted them. Scully stood in the doorway. She hesitated only a moment before confessing. and Mulder approached, looking from one to the other. to the bed as Mulder hovered on the other side. went to Mulder, seeking help. ignoring her partner’s warning glance. an older man who’d been dozing over a magazine. 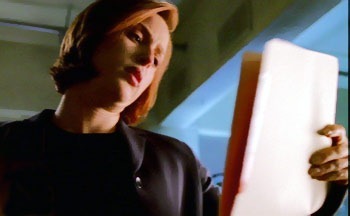 “I’m trying to find out who this woman is,” Scully replied. playing out in front of him. to Samantha. Both women greeted him as he entered. Mulder looked at Samantha, who nodded. “I’ll be there,” Mulder said. she had put her trust in him and was relying on his support. her luck with the regression, then reluctantly left the hospital. salad as she filled him in on her visit with Dr. Williams. medical history it’s hard to draw any conclusions. “You were saying … ?” he grinned. shoving it ruthlessly to one side to dig into the ice cream. Mulder set down his spoon. “That’s what I don’t understand. believes she *is* Samantha, or … ” he trailed off. “What if Sam didn’t get taken from the hospital that night? times he doubted his own memories retrieved in that manner. moving forward while they waited for the physical test results. of constantly glancing back to the past. It had also been a turning point in their relationship. between them, they could both move on together. be the same between them. was watching Scully stirring her melted ice cream. dragged him back to the house. the inside pocket of his jacket. Samantha’s diary. the worn pages, although he knew the words by heart. The last entry. He closed the book. but he’d had other visions that had seemed incredibly real. love to Scully, planning his future with Scully …. wasn’t sure he could ever forgive himself. did not go to her room that night. the detectives personally while Mulder met with Dr.
Peterson. She would join him at the hospital later. preferably in the same bed. and gazed at him solemnly for a few moments. she was and what she was doing. “Do you remember falling?” she asked. had no more recollections about what happened that night. own recollection, or was her truth different than his? “He yells at me. He hits me.” The voice broke with a sob. as he ran out of the room. if not a solid one, by the time she arrived at the hospital. entering the room. She gave Samantha a couple of pills. was leading her out of the room. been trying to tell her. either deceiving you or confusing him with someone else. Scully left the office and went back to Samantha’s room. the exit to use her cell phone to try to contact Mulder. him being alone right now. a little more about Dr. Peterson. difficult to remove from Persian rugs. expected the floor to drop from beneath him. scent invigorated him, made him feel powerful again. “Yes sir,” the voice floated from the box. outrun the accusation that still rang in his head. could be alone and decide what to do next. obscuring his view of the house and the ocean beyond. away to Oz, but he’d known they would be safe. was just waiting for someone to visit. civilization hadn’t quite taken over Quonochontaug yet. to beg Scully’s forgiveness later. squeal of terror and delight as she swung out over the water. dropped the photo album as he turned to see Dr. Peterson. his head and he’d be in touch with her soon. overnight bag near the foot of the bed. asked, already knowing what the answer would be. “What are you doing here?” Mulder asked. Agent Mulder.” Dr. Peterson smiled apologetically. breakfast he’d eaten earlier that day and it was past noon. Dr. Peterson could help clarify things. glass. He hadn’t realized how thirsty he was. “She wanted … ?” He opened his eyes with an effort. his arm and dragged him up. *Scully? Not Scully. Damn. Should have called her. “If Fox was here, he’d do something,” she muttered. reputation for her impressive results with regression therapy. filed, one death being ruled a suicide, the other accidental. be making up a name like that, and she seemed surprised. name Mulder in the area. might be Mulder, Scully opened it. the cigarette dangling from his lips. desire to wipe that smirk off his face. “I’m not going back to the hospital,” Samantha said. string two thoughts together, much less form words. He shook his head and immediately felt nauseous, dizzy. She hit him hard enough that he tasted blood in his mouth. raise them from the chair. Scully took a corner with only a thought about braking. able to get access to Dr. Peterson’s office. through the files on the desk. hadn’t been part of his plan? the same age, they were both runaways in the same area. felt at his parents’ trust. The heady feeling of power. always convinced she could beat him at this game. he had spoken to his sister. 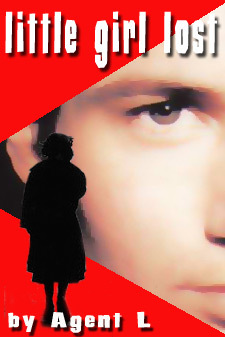 go after her, but the boy’s eyes were blank, his body limp. someone had taken her, wouldn’t you have run after them? who leaned forward, staring at him intently. her fingers along his throat, checking his pulse. least a smile. “Sorry. We’re in the summer house. still held him in the chair, flexed his stiff fingers. He noticed she made no move to release him, however. he been unconscious? Scully as probably worried by now. cell phone range. “I should check in with my partner,” he said. She shook her head and gestured toward the phone. “Fox, I called Agent Scully while you were sleeping. Mulder herself. It was an unspoken agreement between them. hoped someone would find her. That *he* would find her. he launched himself forward and knocked her off balance. into the kitchen where he’d left his car keys earlier. at his fingers, they were stained dark in the fading light. Blood. broken chair without realizing it. the woods. He had to risk going back to the summer house. miles out of the way. sank to the ground, shivering despite the warm temperature. Someone would come for him — Dr. Peterson or Scully. had to keep calling, had to let them know where he was. wearing old jeans and a sweater. “Samantha?” He reached out a shaky, blood-covered hand. gasping as the pain shot through him like a fiery spear. more than he had, and he was whining about his injury. often did to comfort or encourage him. “Keep calling. They pulled into the yard to see two cars already there. out her flashlight and her gun. “Stay with me,” she ordered Spender. smoke on the drive down. switch, pleasantly surprised when it worked. Scully whirled around at the voice, her gun pointed at Dr.
polished professional Scully had met at the hospital. believed he had no other choice. crooked trail into the kitchen, out the French doors. the room as if he were simply a casual observer. of the house. “Mulder!” she called. in the thick grass, and started moving slowly into the woods. fingers and smiled her acceptance. a faint reply. She called his name again, and then stood silent. bleeding. He cried out once, then lay still beneath her hands. phone to call 9-1-1. No service. focused on something else, staring off into the darkness. her attention to him. “Mulder, I need to get you to the car. of trance state to escape the worst of the pain. vision and he seemed to become aware of her presence. “Yeah … I … ” He suddenly looked away from her again. struggling to stay conscious. “..s’okay … ” he murmured. car as carefully as possible, wincing at every stifled groan. cooperative during his “therapy session.”be in his system. medical attention, Scully ran into the house. Both of them had disappeared. room and took a quick look at his chart. Before Scully could retort, there was a tap at the door. “Are you staying in the area?” Scully asked. She blinked back tears, then straightened her shoulders. “The summer house?” Scully raised an eyebrow. pillow as the painful knot in his back began to loosen. Scully leaned over to drop a gentle kiss on his forehead. roused him and he reached out to grab her hand. be offended when he fell asleep in the middle.